Take an enlightening journey through 5,000 years of civilisation! Shen Yun's unique artistic vision expands theatrical experience into a multi-dimensional, inspiring journey through one of humanity's greatest treasures - the five millennia of traditional Chinese culture. This epic production immerses you in stories reaching back to the most distant past. You'll explore realms even beyond our visible world. Featuring one of the world's oldest art forms - classical Chinese dance - along with patented scenographical effects and all-original orchestral works, Shen Yun opens a portal to a civilisation of enchanting beauty and enlightening wisdom. Traditional Chinese culture - with its profoundly optimistic worldview and deep spiritual roots - was displaced by communism in China. 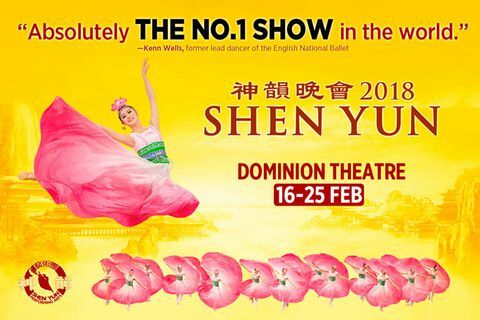 Today, only New York-based Shen Yun is keeping this precious heritage alive on stage. And it's an experience that will take your breath away. Shen Yun is not available to book, please sign up to our newsletter for updates and offers on forthcoming and available shows. Children under 5 years old will not be admitted.